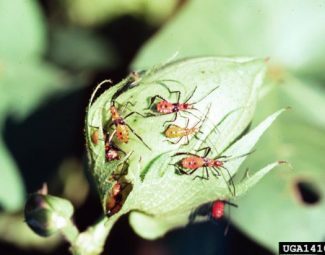 Primary weed host of the leaf-footed bug is thistle, but they can also be found on jimsonweed, goldenrod, and elderberry. Ornamental hosts include: beargrass, hibiscus, crape myrtle, ligustrum, ixora, gladiolus, Gerbera daisy, and rose. 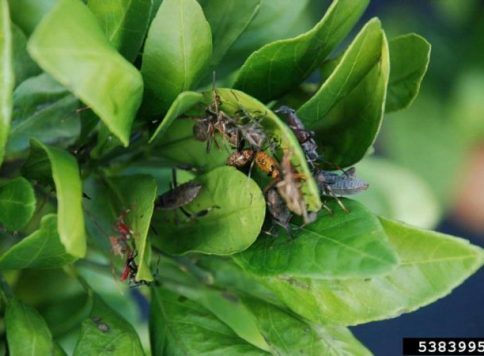 Pest of many agricultural crop such as: citrus, pecan, potato, tomato, sunflower, bean, cowpea, eggplant, bell pepper, okra, cucurbits, grain sorghum, blueberry, blackberry, plum, peach, lychee, pomegranate, loquat, pear, apple, persimmon, oat, rye, wheat, barley, and soybean. 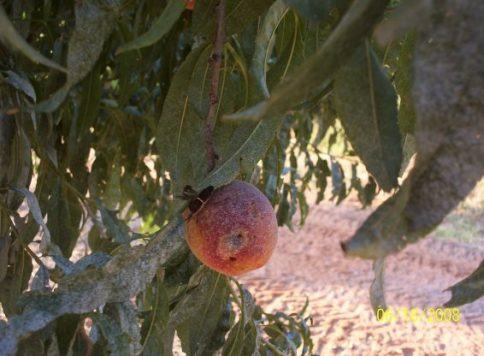 Piercing, sucking insect that discolors and/or distorts normal growth in fruit and seeds. Damage to small fruits and seeds can cease development. Feeding can also increase vulnerability to disease. 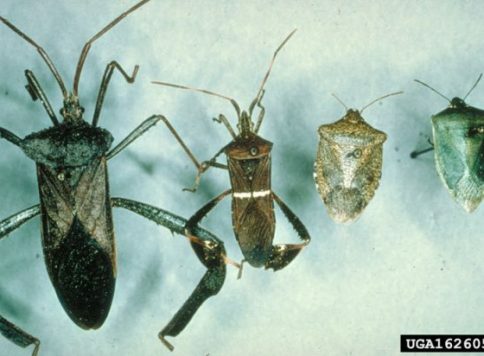 Damage similar to stink bug. Appear to secrete and react to pheromones. 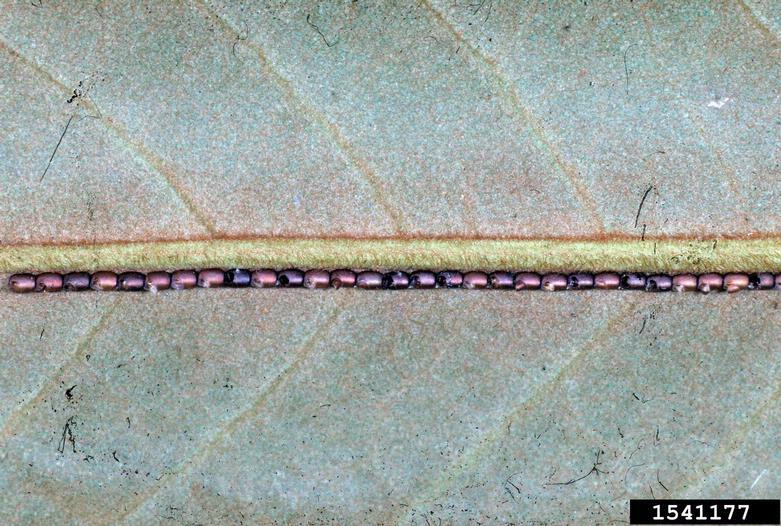 Eggs… (5-7 Days) Laid in cylindrical rows on leaves and stems. Reddish with flat undersides. 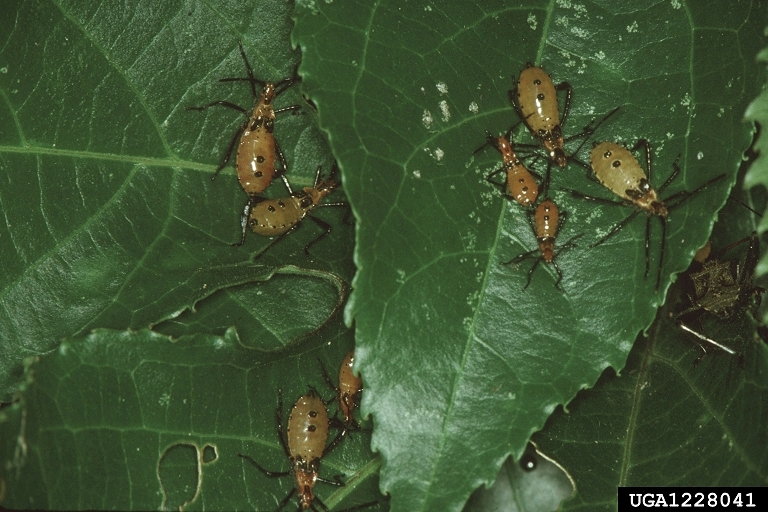 Nymph… (25-30 Days) 5 instars. Similar in appearance to adults, but do not have wings. Flattened hind legs only present in last stages of development. Adult… Approx. ¾ in. Winged and capable of flight. Distinguished by flattened hind legs. Over-winter in colder climates as adults in mulch, brush and other plant trash. No overwintering in warmer climates. Emerge from over-wintering in late spring. 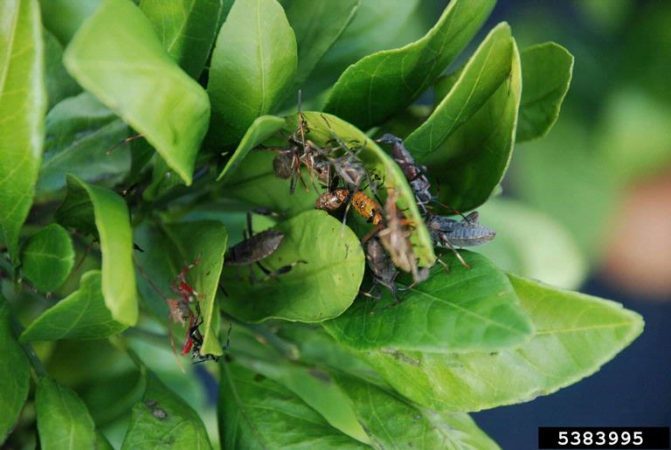 The use of traps baited with the aggregate pheromone methyl (E, Z)-2,4- decadienoate (Aldrich et al. 1991) around borders may be an effective control technique to trap over-wintering adults. 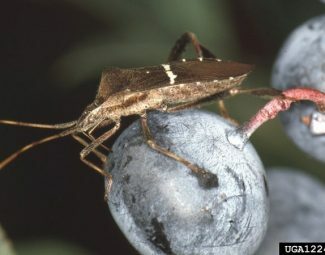 This pheromone attracts both sexes of the nymph and adult stages of Euschistus. 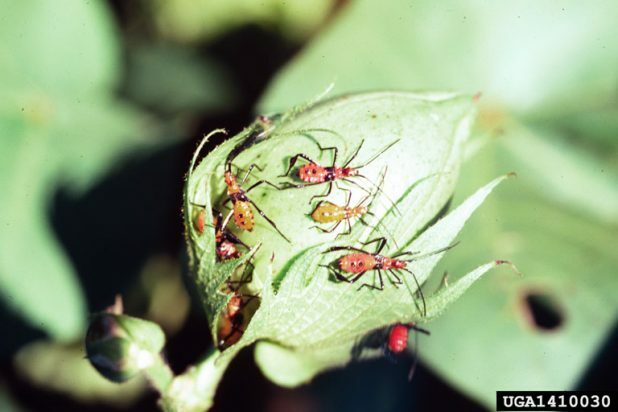 These traps have also been used inside the edges of fields to aggregate populations to the edges and allow for edge treatments, instead of treating the entire field. 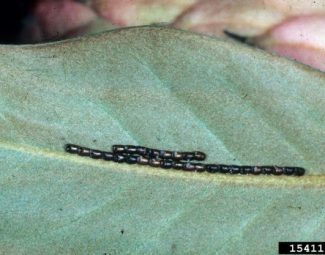 Telenomus podisi is a parasite of eggs, but is not commercially available (2010). 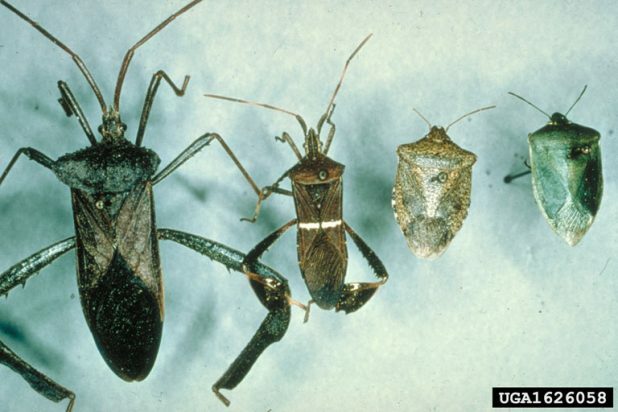 No till fields seem to have higher incidence of leaf footed bug populations, especially when a winter crop is planted behind a soybean crop. The winter crop provides winter cover and decreases mortality. Early planting may allow for harvest to occur before populations build and migrate from preferred host crops. 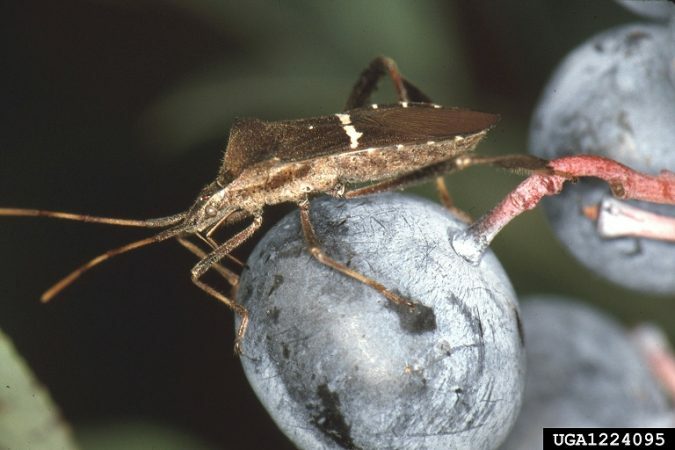 Mowing of grass surrounding the host crops seems to “flush out” adults and should be avoided during critical fruit development stages. Remove weeds that serve as habitat during periods when preferred crops are not available. Aldrich, J.R., Blum, M.S., Duffey, S.S., and Fales, H.M. 1976. 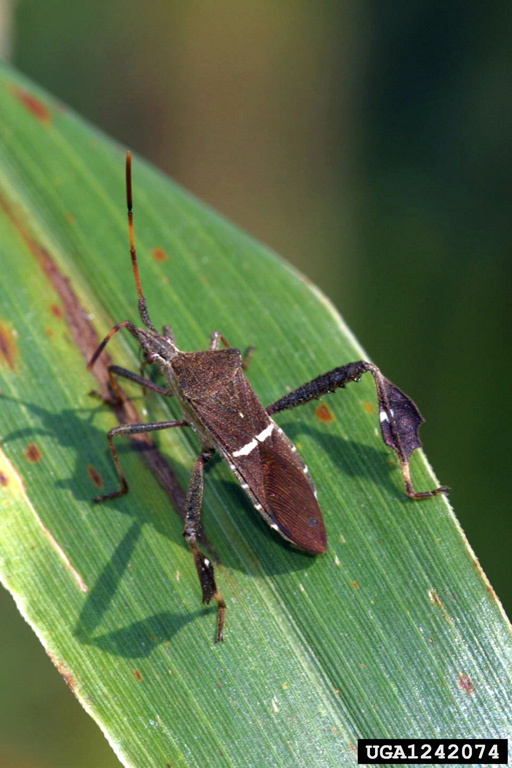 Male specific natural products in the bug, Leptoglossus phyllopus: chemistry and possible function. 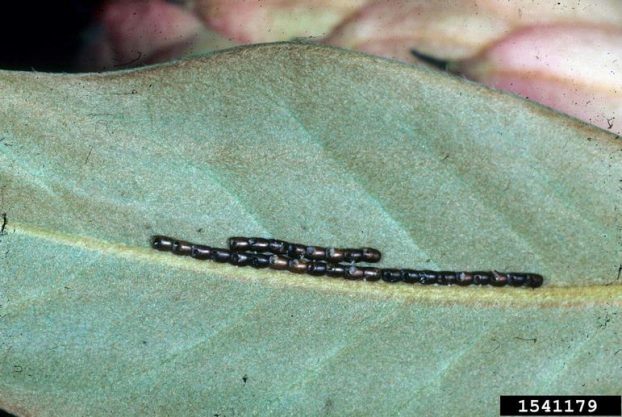 J. Insect Physiol. 22:1201-1206.